Biafra: Where Are Those Voices Echoing The Deceit Called "Restructuring?" Days have gone, weeks gone and months swiftly passing away without a single voice further echoing that beautiful "Package" called 'Restructuring' any more. What has happened? Who has spoken again? Where are the agents and proponents of restructuring as an alternative to the Hausa-Fulani-styled and carefully skewed 'One Nigeria'? The voices are now cold, has grown feeble, the fake and watery venoms calmed, the grammarian students has gone berserk, the professors asleep to awake God-knows-when, the El-rufai restructuring package committee are no longer on the news! What has happened to all of them? Have they suddenly gone missing? Where are the Bendel-warriors declaring Bendel State? Where are the Conveners of the Odua Republic? Where are the Northern illiterate theorists and their Northern Youth groups? Where are the Chameleonic campaigners for political alternative (APC)? Where are those drawing the boundary between Biafra and Biafra(South-South political errand boys)? Where are the Military spokespersons, hopping from one lie to the other and from one denial to another? Where are the Eastern political jobbers and the errand boys in the mould of 'OHANAEZE-NDI-IGBO', where are the members of the Southeast governors forum? What has become of their "ghostly Amnesty packages?" Are the pack of dust-bins called the Southeast governors so quickly through with their Amnesty package? Has the Igbo socio-political group, Ohanaeze, given up so quickly on their crusade for Restructuring? Why all these sudden evaporation of the voice of strength from these campaigners of one Nigeria? Too many questions still contesting for space on my mind cannot be exhausted in this piece alone! What is happening? Did anyone of the aforementioned campaigners for political alternative forgotten the spelling of the deceitful package? Wait here is the spelling R-E-S-T-R-U-C-T-U-R-I-N-G or beckon on a Biafran kid schooling outside of Nigeria via the kid's guidance or parents as the case may be and inquire from the child, the spelling of the word you most frequently muttered each time you visited Aso-Rock or whenever your names appeared on the pages of the Nigerian media outlets. 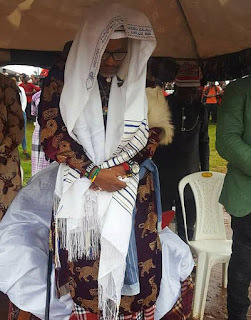 Summon all the Igbo slave professors and economic refugees hiding behind the popularity of Mazi Nnamdi Kanu the great and IPOB to spew their illiterate gibberish called alternative 'Modus Operandi' as against the approach been divinely inspired through Mazi Nnamdi Kanu (THE GREAT). Also call the Lagos economic refugee and old slave-boy with the nomenclature Joe Igbokwe to take the podium now! Call all the Northern-money-has-bought Igbo leaders to come forward and take the podium for alternative 'modus-operandi' in the restoration project for Biafra! Summon all the Igbo slaves, anti-Biafra and Nigeria-bought internet warriors to come up now! I also have not seen nor heard from BIM's leader, Raphael Uwazuruike, the sworn-in errand boy. Where are all the Abuja-based political contractors for the One-Nigeria and Biafra critics? Come up now or remain silent forever. Wherever a proponent of 'One Nigeria' sees a Biafran, I require that the former must stoop low or prostrate and say to the citizen of IPOB "Good morning Sir, live long!" If you are an IPOB, beat your chest and say "I'M A HERO!" Because what we do, no man dares! By the time Mazi Nnamdi Kanu is released by Nigeria to commence the second phase of his campaign, which I believe must be the final round, thunder of hypocrisy must destroy any of the groups I mentioned earlier and their cronies who have not done anything in the alternative up until now, If they ever criticize the living Hero, Mazi Nnamdi Kanu when we shower him with accolades and love. Therefore when you hear the name, Mazi Nnamdi Kanu, prostrate and pay obeisance to him or die in envy, jealousy, strife and shame.